Comey lied to Congress when he certified that his agency had “reviewed all of the communications” discovered on a personal laptop used by Clinton’s closest aide, Huma Abedin, and her husband, Anthony Weiner. COMEY: And so they came in and said, we can see thousands of emails from the Clinton email domain, including many, many, many from the Verizon Clinton domain, BlackBerry domain. They said we think we got to get a search warrant to go get these, and the Department of Justice agreed we had to go get a search warrant. So I agreed, I authorized them to seek a search warrant. And then I faced a choice. And I’ve lived my entire career by the tradition that if you can possibly avoid it, you avoid any action in the run-up to an election that might have an impact. Whether it’s a dogcatcher election or president of the United States, but I sat there that morning and I could not see a door labeled no action here. I could see two doors and they were both actions. One was labeled speak, the other was labeled conceal. Because here’s how I thought about it, I’m not trying to talk you into this, but I want you to know my thinking. Having repeatedly told this Congress, we are done and there’s nothing there, there’s no case there, there’s no case there, to restart in a hugely significant way, potentially finding the emails that would reflect on her intent from the beginning and not speak about it would require an active concealment, in my view. And so I stared at speak and conceal. Speak would be really bad. There’s an election in 11 days, Lordy, that would be really bad. Concealing in my view would be catastrophic, not just to the FBI, but well beyond. And honestly, as between really bad and catastrophic, I said to my team we got to walk into the world of really bad. I’ve got to tell Congress that we’re restarting this, not in some frivolous way, in a hugely significant way. And the team also told me, we cannot finish this work before the election. And then they worked night after night after night, and they found thousands of new emails, they found classified information on Anthony Weiner. Somehow, her emails are being forwarded to Anthony Weiner, including classified information, by her assistant, Huma Abedin. And so they found thousands of new emails and then called me the Saturday night before the election and said thanks to the wizardry of our technology, we’ve only had to personally read 6,000. We think we can finish tomorrow morning, Sunday. And so I met with them and they said we found a lot of new stuff. We did not find anything that changes our view of her intent. So we’re in the same place we were in July. It hasn’t changed our view and I asked them lots of questions and I said okay, if that’s where you are, then I also have to tell Congress that we’re done. Look, this is terrible. It makes me mildly nauseous to think that we might have had some impact on the election. But honestly, it wouldn’t change the decision. This was all a lie. As a matter of fact this included multiple lies. Comey not only lied about the FBI reviewing all 694,000 emails on laptop, he also stated to Congress that ‘they’ believed that the FBI needed a warrant to search the Weiner laptop. This was no doubt something conjured up by the corrpt leaders of the DOJ and FBI as rationale for the delay in reviewing the emails. The fact is, the FBI had already looked at the Weiner emails nearly a month before in September. The FBI didn’t need a warrant to look at the emails – they already had looked at the emails! 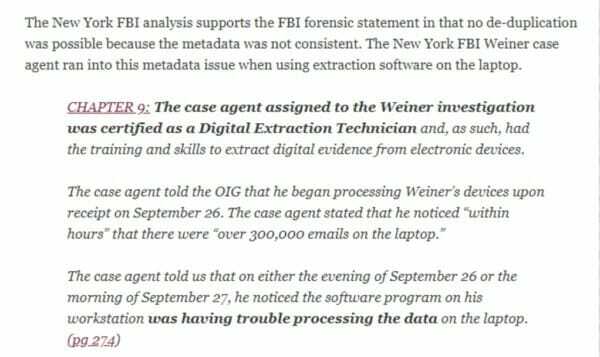 The FBI case agent looked at the Weiner emails a month before Comey stated that the FBI needed a warrant to review the Weiner laptop. It looks like Comey lied again, and again.